Photo purchased by myself for commercial use, 2014. Earlier this week, the price for a gallon of gasoline fell below $2.00 a gallon in some locations around the San Antonio, TX region. The price of oil closed on Friday below $67 a barrel with Natural Gas NYMEX around $4 with forecasts still predicting a free fall in the price. In a world of chaos where Russia is annexing territory, Iraq and Syria is in shambles without effective governments, the Middle East is still suffering from the Arab Spring, Iran is going to get a nuclear weapon while promising the destruction of Israel, plus the growing energy demand in Asia and across the globe; the market should be freaking out and the price should conceivably be closer to $150 a barrel than $67. Americans will certainly not complain as this will put extra money into their back pockets and may actually give a mini-stimulus to the economy for the Christmas shopping season. Yet, these latest developments in the energy sector will have massive implications worldwide, especially in the foreign policy arena. The energy-dependent economies need the price of oil to be much higher. 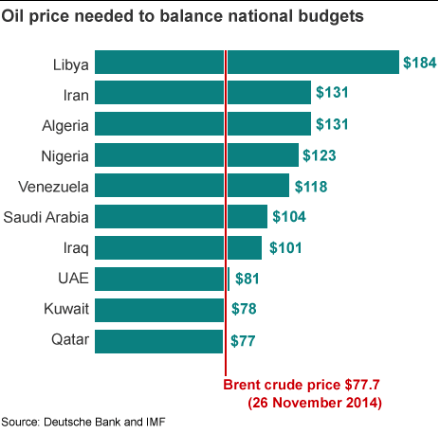 Business Week claims Russia made its 2015 budget on the forecast of oil being around $100 a barrel. With sanctions hurting their economy, the Ruble losing much of its power compared to the U.S. Dollar, along with the price of oil and natural gas well below their forecast, Russia will go into a depression. Putin is the man who is known for rebounding the Russian economy and nationalizing its energy industry in response from the collapse of the Soviet Union. Now he may have to answer for the soon-to-be next depression in Russia. Yet, this also raises another interesting question, why is OPEC refusing to cut production if so many of the countries (as shown in the chart above) need oil to be much higher? Saudi Arabia needs it to be around $100 a barrel because it has been subsidizing its population to prevent the Arab Spring there to preserve the House of Saud, yet they are pushing for the same levels of production. There are two reasons for this, which the second is in response to the first reason. 2014 is a historical marker for U.S. energy. It officially surpassed Saudi Arabia as the world's largest producer in oil and earlier surpassed Russia as the world's largest producer of natural gas. Because of laws that are around 40 years old banning exports (with certain and limited exceptions); the U.S. is still way behind in selling the commodities on the international market; much to the chagrin of Europe and parts of Asia. The fracking revolution from North Dakota to Pennsylvania to Texas now has America projected to be energy self-sufficient (with Canada as a partner) by 2020. America not even at its full production potential as federal lands still have bans on drilling (as almost all of this revolution is in the private sector and on private lands) yet has crashed the price in energy. On a recent trip in South Texas with some of the best and brightest minds in the sector to visit multiple fracking sites and all stages of the operation (to the pipelines to the refineries in Houston and Louisiana area), it was clear just how beneficial this is to our economy, in fact it's almost incomprehensible. Hotels and Motels charge by the hour (at rates you'd expect to be for a day), restaurants are packed, vehicles are brand new, repair shops are all over, the only industry hurting is fast-food employees. We met with Halliburton's number one team who are breaking fracking and drilling records right here in the United States. The U.S. can control its own destiny soon in energy. 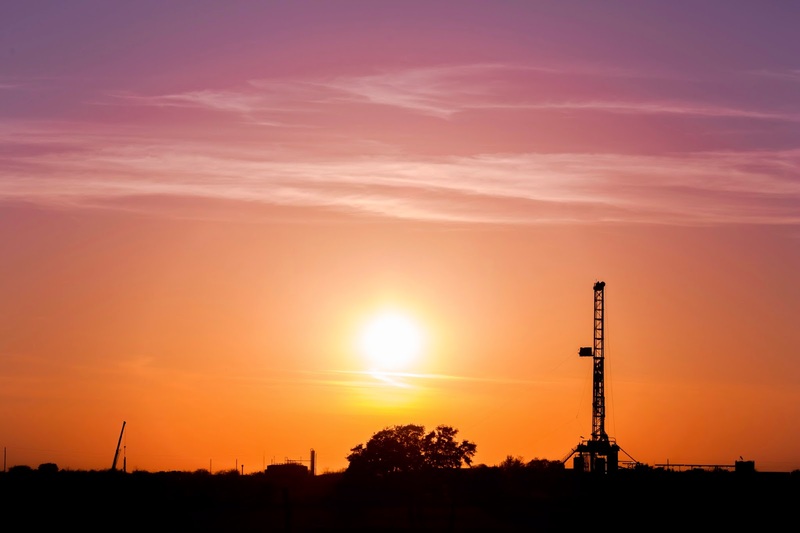 The price of oil and natural gas right now leaves very little room for profits because in many shales, America has to drill thousands of feet in order in order to reach the resources. OPEC realizes if America stays in the energy game, it's power and control is doomed. Permit requests have been falling in the U.S. as a response to the now low prices. Saudi Arabia is hoping to take a short term loss for a long term goal of American companies pulling out of the U.S. and going elsewhere (largely back to them) for a long term gain of higher oil prices above $100 a barrel which OPEC and Russia need. It's a gamble, but this is their only move. Believe it or not, this question is more complicated than what it may seem at first. The United States should look after its own needs and become energy sufficient. This is a massive opportunity to secure our needs and also revolutionize our own economy and perhaps be a piece to balancing the budget. The refining (we need much more LNG production, the first LNG train in the U.S. is still in production) and export opportunities to Europe and Asia can make the US a potential power player in the exporting of energy as well. Yet, we will also have to face the global consequences of our action. For their own economic needs (particularly energy), Russia will be forced to take its energy resources and instead of mainly sending them to Europe, will make it travel east to China. This will only further the rift between the West and Russia and perhaps could bring about a global conflict along the lines of NATO vs. Russia & China. Putin will also have to escalate conflict around the globe because the only way to potentially raise fuel prices is with conflict. Ukraine now could look minor in comparison to future conflicts perhaps spanning from the Caucasus, Scandinavia, to Moldova. If the United States no longer needs foreign fuel outside of North America, the economies of OPEC will not be able thrive causing a depression. Authoritarian regimes will collapse. Many may argue this would be a fantastic scenario, and the optimist could say democracies would take over. One should be cautious. Is Libya better off without Gadaffi? Is Iraq better off without Saddam Huessein? Both were brutal dictators that now share a special place in Hell. Yet in both scenarios, radical terrorism has taken over and created a nightmare situation. Imagine what will happen to Saudi Arabia, Qatar, and Bahrain where the U.S. has massive military interests if their regimes fall due to low energy prices. Radicals will takeover and bring a huge security threat to sovereign nations across the globe. The American homeland will thrive, yet this situation with leaders such as Putin and an expanding nationalism attitude in China could then cause a third global conflict. The powder keg was all ready in place for World War I; the spark was the assassination of Archduke Franz Ferdinand. The situation in the Mid East coupled with low energy prices could be the modern powder keg.